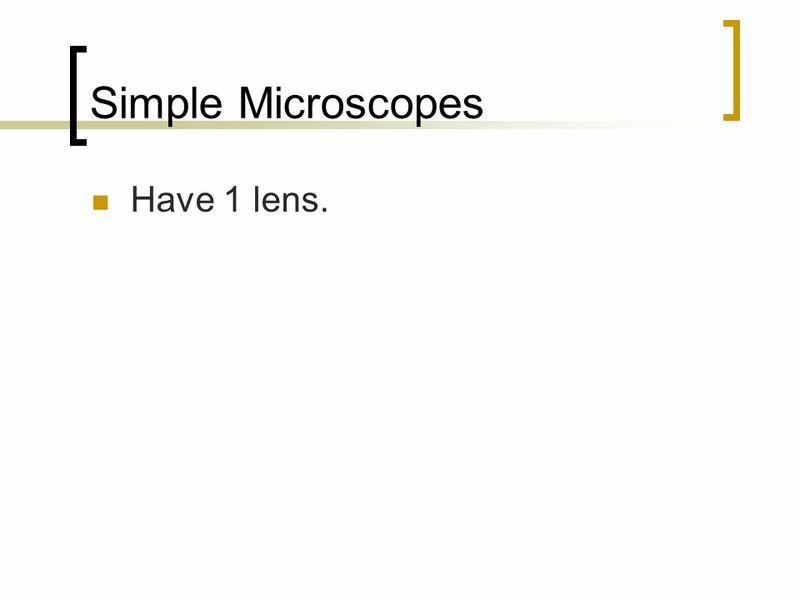 2 Simple Microscopes Have 1 lens. 4 Magnification The change in apparent size. 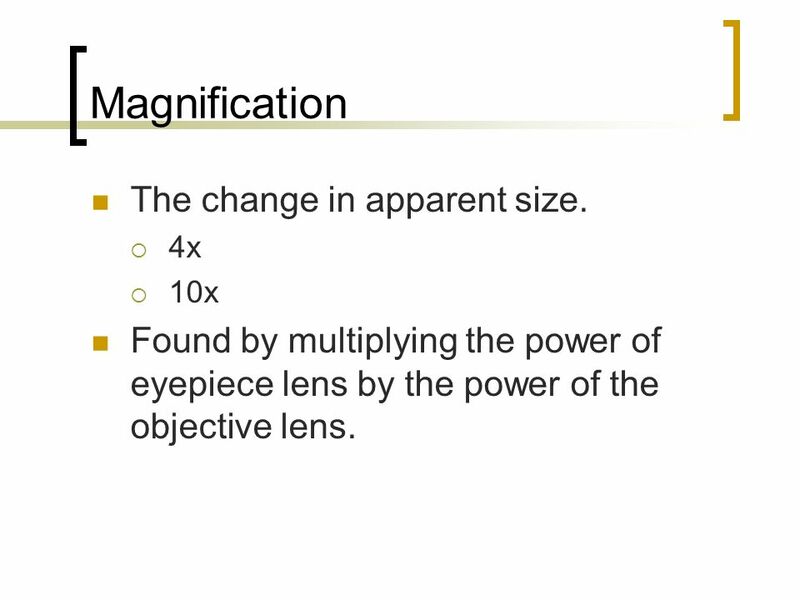 4x 10x Found by multiplying the power of eyepiece lens by the power of the objective lens. 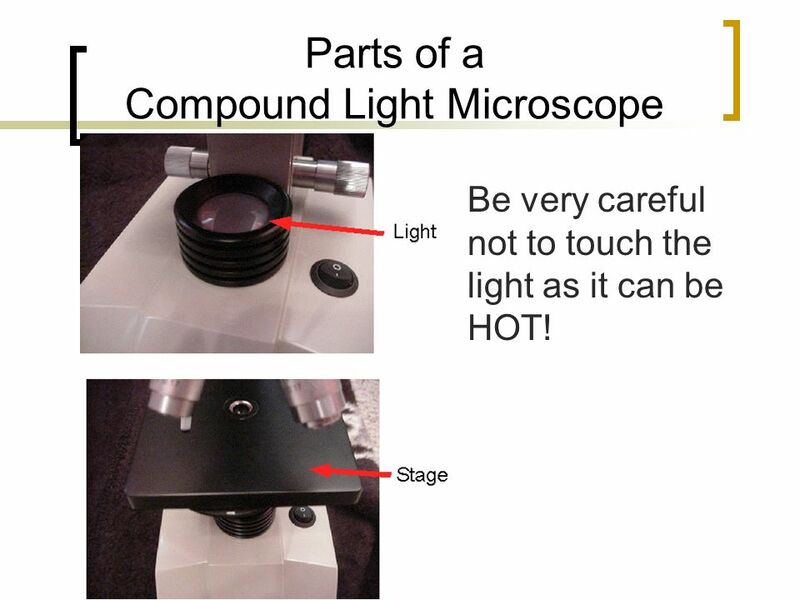 Be very careful not to touch the light as it can be HOT! 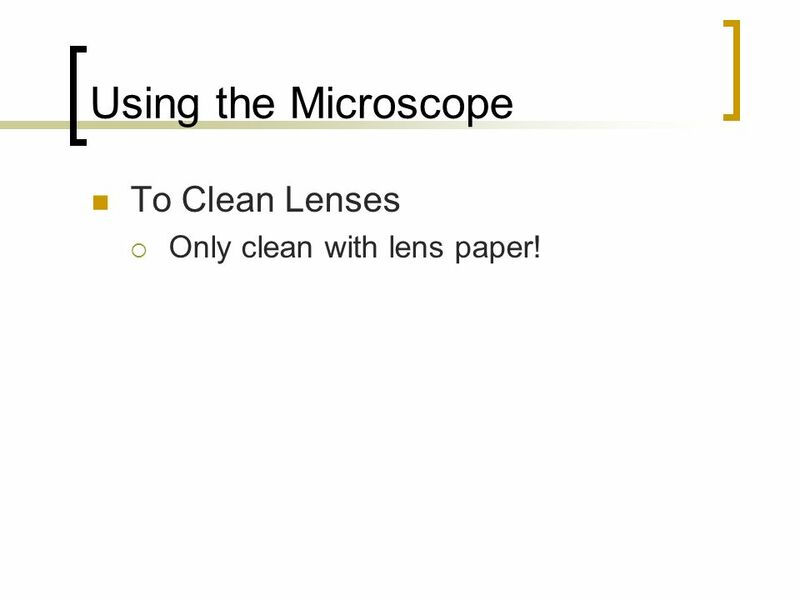 15 Using the Microscope To Clean Lenses Only clean with lens paper! 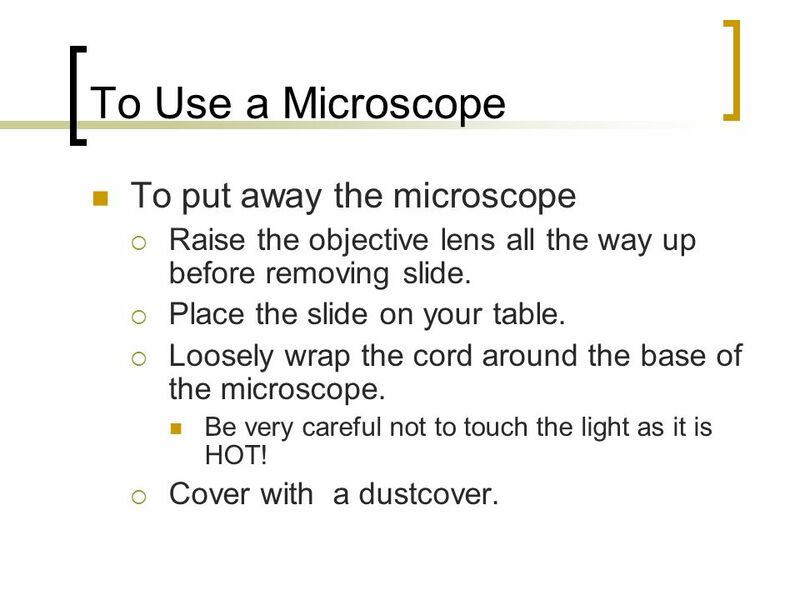 16 Using the Microscope Preparing a slide: Caution: Glass! Place a small drop of water on the slide. Place the “e” in the drop of water. Hold a cover slip at an angle to one side of the water drop. Slowly drop the cover slip onto the slide, trying to avoid air bubbles. With the nosepiece raised all the way up, place a slide over the circular hole in the stage. Secure the slide with the stage clips. 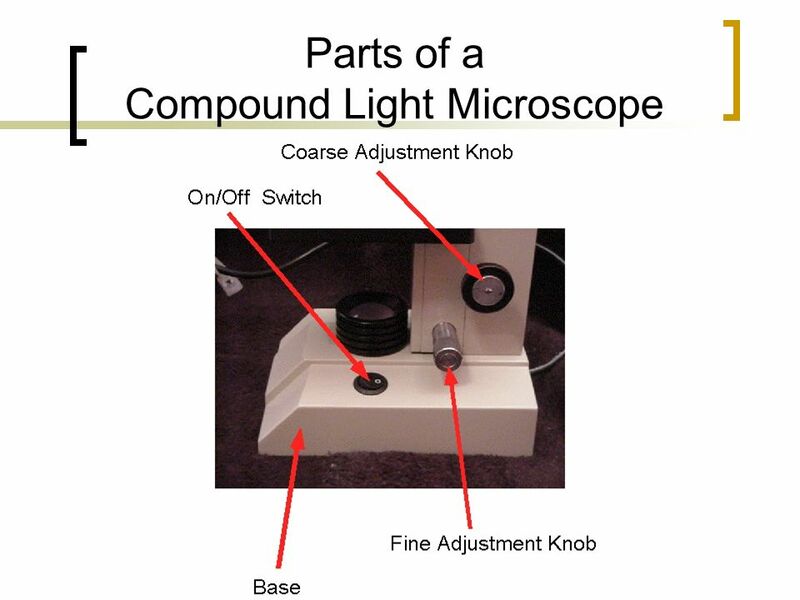 Looking at the side of the microscope, lower the objective lens until it is almost touching the slide using the coarse adjusting knob. 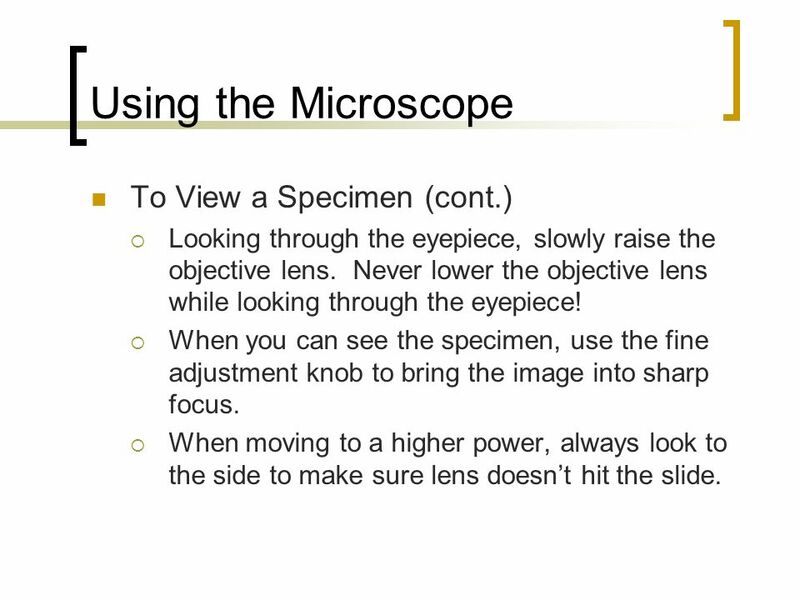 Looking through the eyepiece, slowly raise the objective lens. 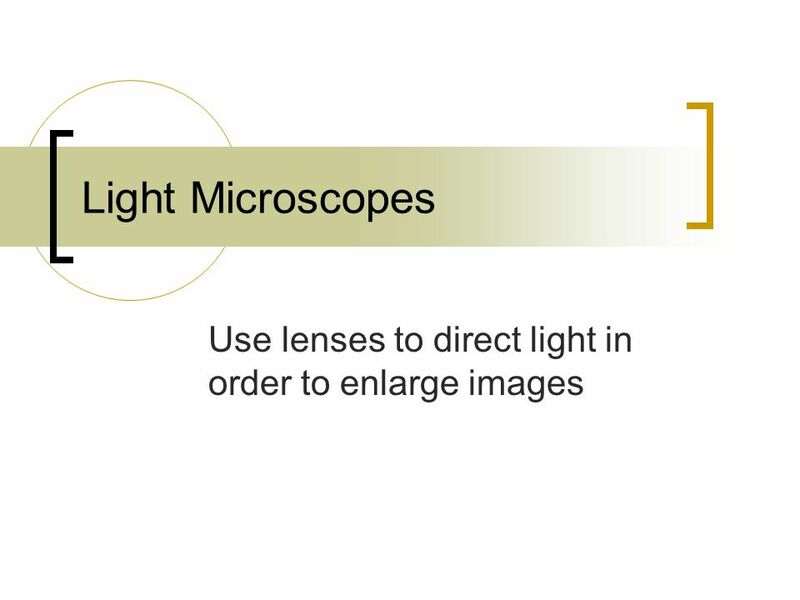 Never lower the objective lens while looking through the eyepiece! 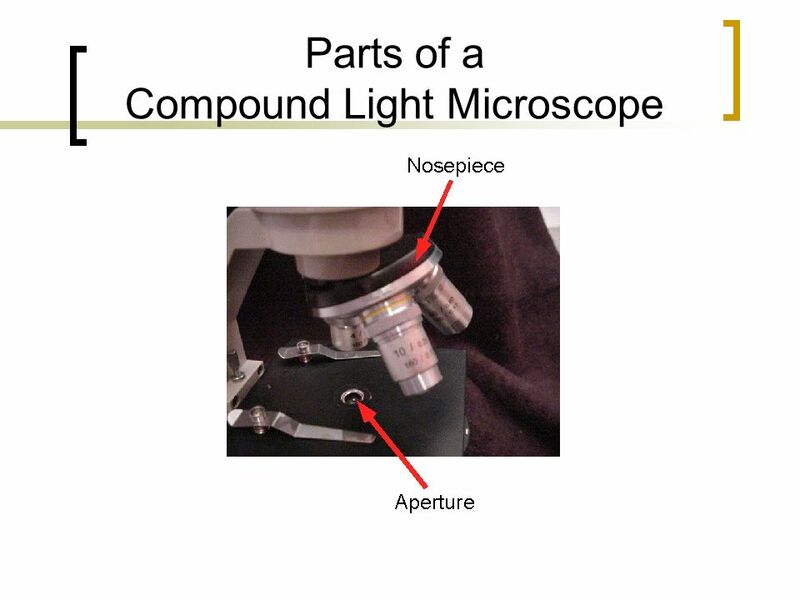 When you can see the specimen, use the fine adjustment knob to bring the image into sharp focus. When moving to a higher power, always look to the side to make sure lens doesn’t hit the slide. 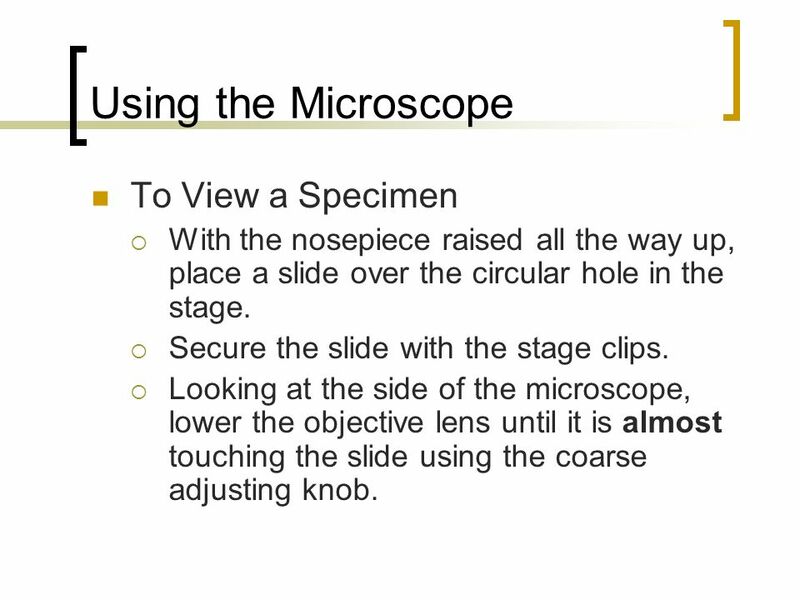 Raise the objective lens all the way up before removing slide. Place the slide on your table. 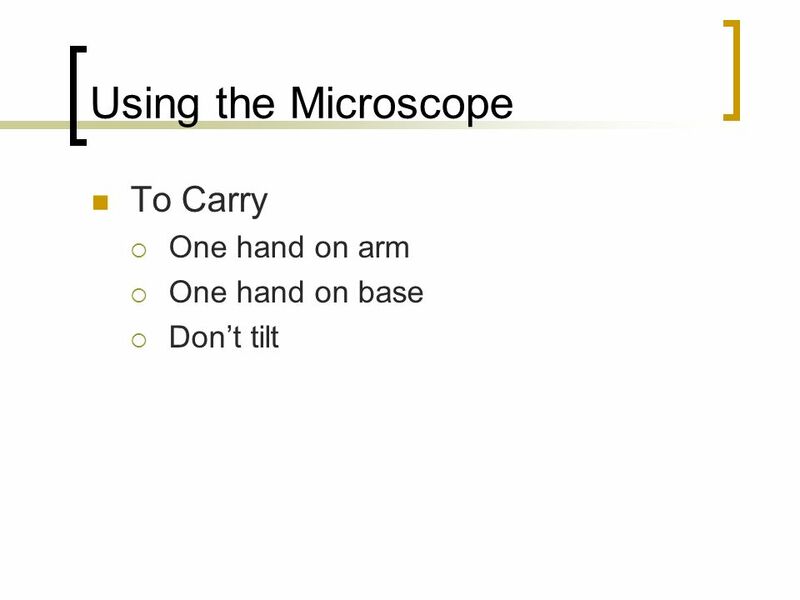 Loosely wrap the cord around the base of the microscope. Be very careful not to touch the light as it is HOT! Cover with a dustcover. Carry properly to cupboards. 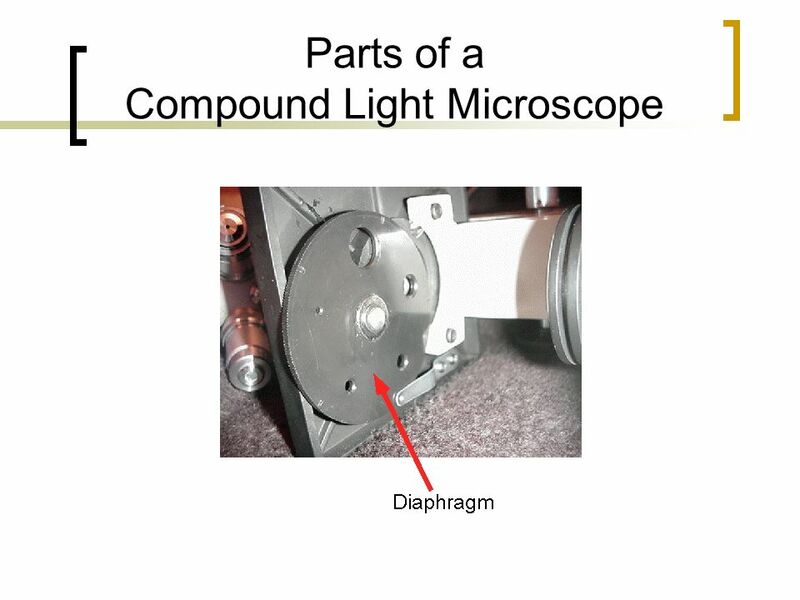 Never put the microscope on its side. 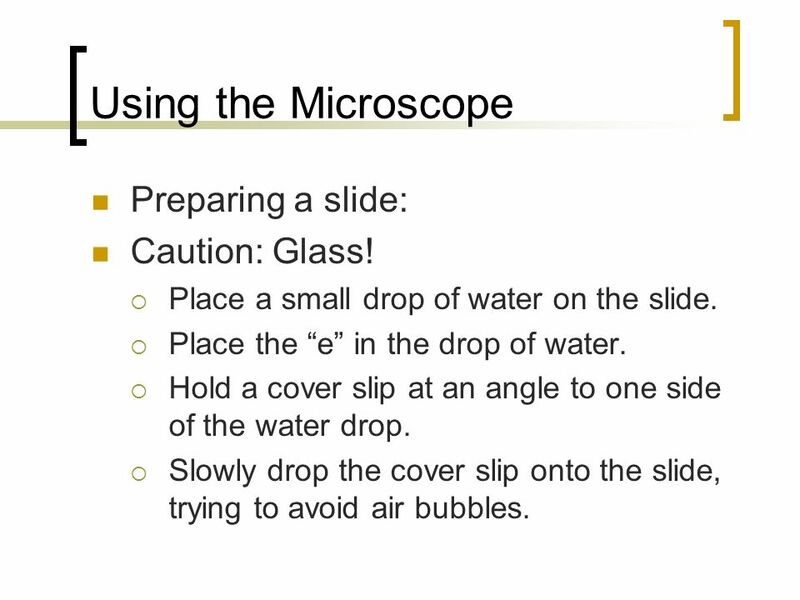 Clean the slide and cover slip with water...be careful not to drop as they are glass and will cut fingers! 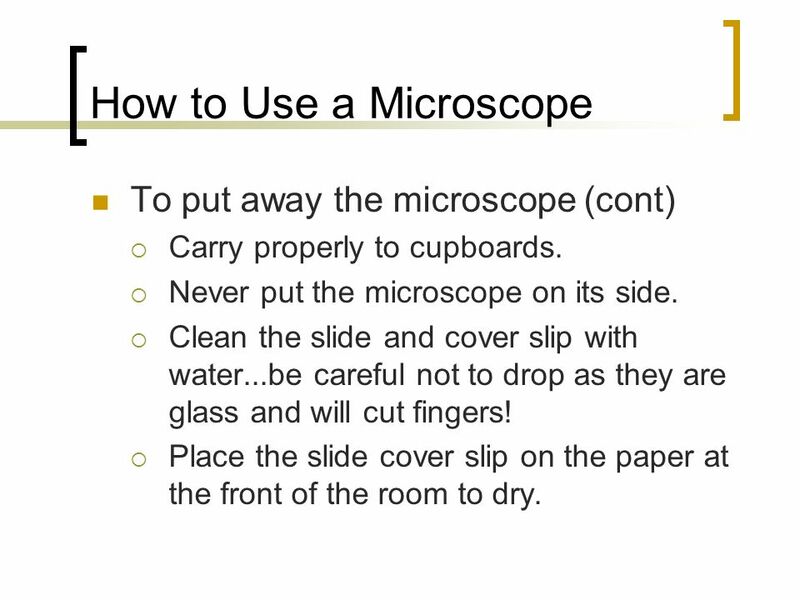 Place the slide cover slip on the paper at the front of the room to dry. 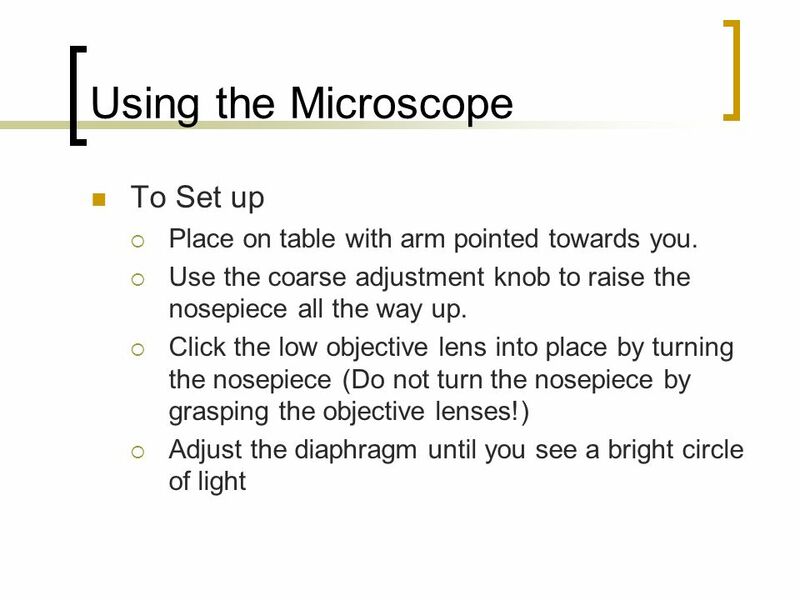 Download ppt "Use lenses to direct light in order to enlarge images"
T. Trimpe Body Tube Nosepiece Objectives Stage Clips Light Ocular lens (Eyepiece) Arm Stage Coarse Adjustment Fine Adjustment. 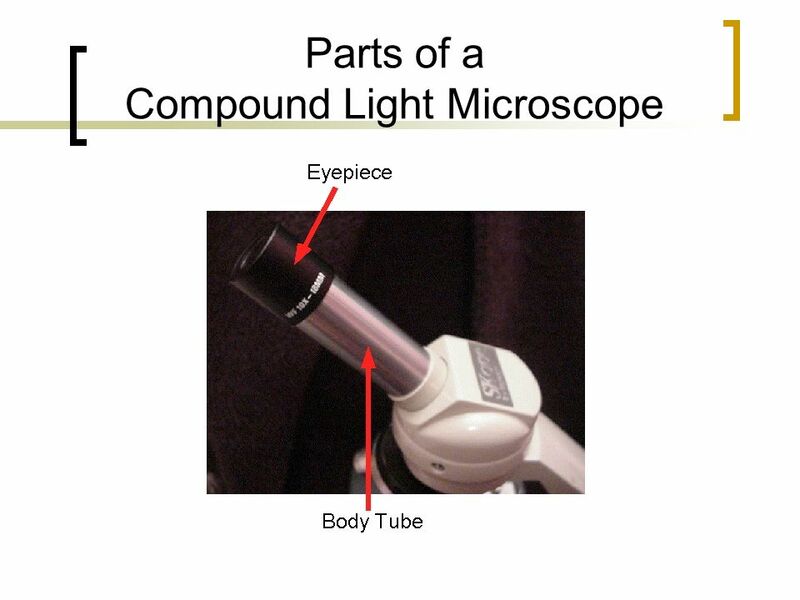 Microscope One or more lense that makes an enlarged image of an object. 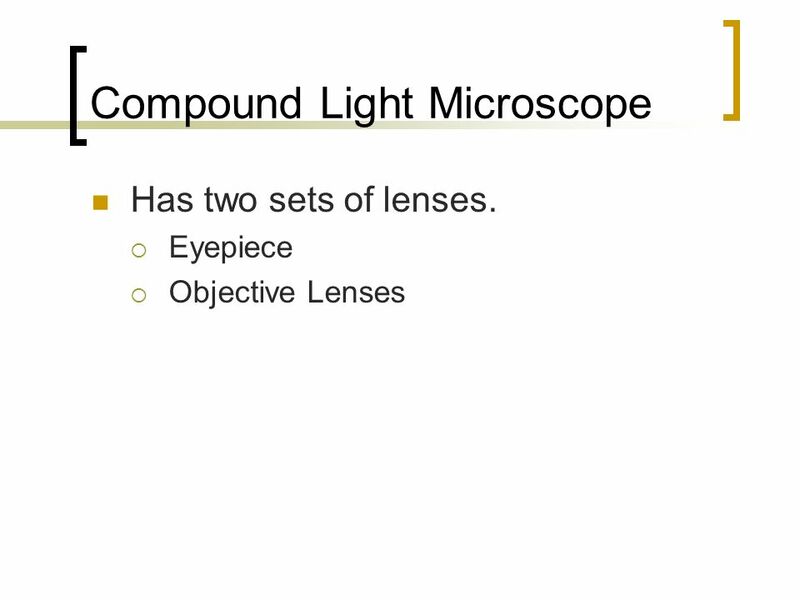 Occular lens Body Tube Arm Objective Lens Stage Stage Clips Base Diaphragm Light. 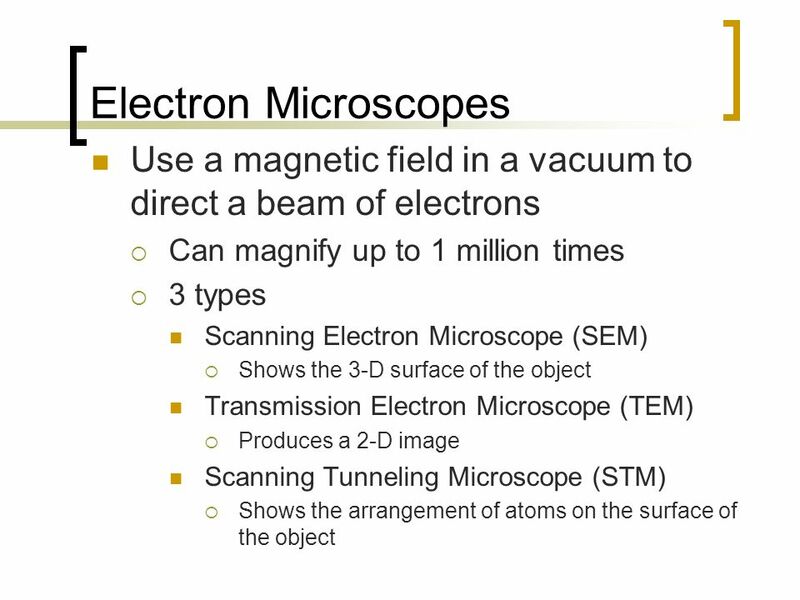 Unit 3 – Powerpoint #1 Honors Biology  Use a beam of Light  The specimen can be dead or alive. Can You Guess What It Is?  string beans  plastic  paper towel  Velcro  push pins  mushrooms  a bone  a tree branch  a strand of hair. 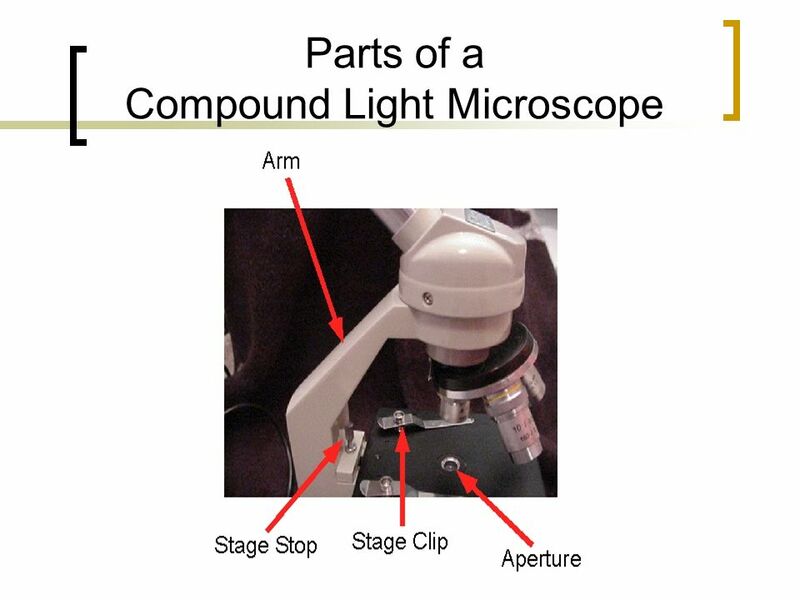 MICROSCOPES: Tools of Science Devices for magnifying images too small for the unaided eye to see. DO NOW: 1.Hand in the field trip brainstorming you wrote on Friday. 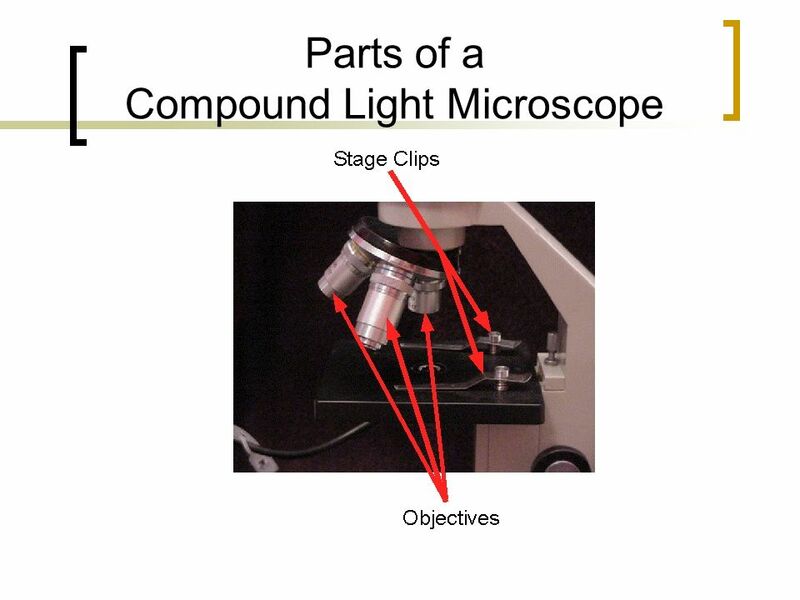 2.Take out your microscope Green packets from last week. 3.In your NOTES section of.